As a mum on a mission, it is often a delicate balance to fit in missional activities in my local community with my daily commitments to my home and family -I’m sure you feel that too! And after having a bit of a rollercoaster of a day yesterday I thought I would share with you a day in my life. Enjoy! 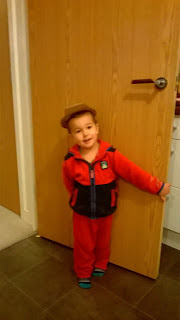 8am – the chaos of the morning has just died down as daddy and Sam head out the door to nursery/work. Today is a special day as Reuben has been asked to play baby Jesus in an interactive nativity experience on of our church’s extension sites is putting on for a local primary school. So we quickly get dressed and sorted and head out the door. 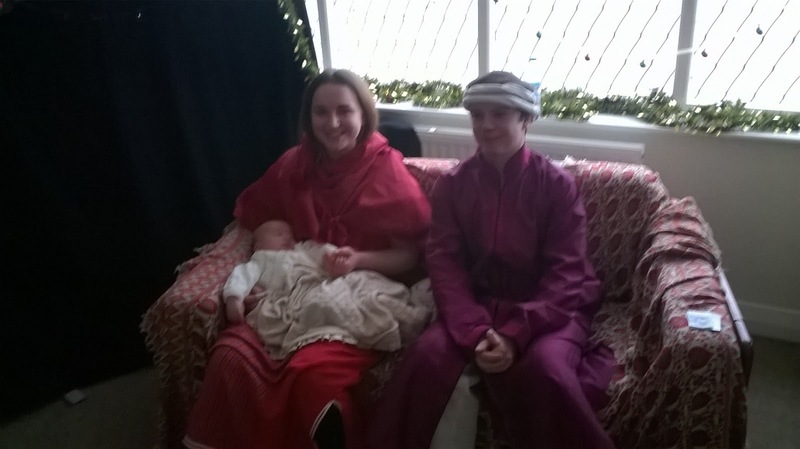 9am – arrive at Thurcroft building and feed Reuben whilst everyone else gets ready for the nativity. Baby’s routine can’t go out of the window even when there is outreach to be done! My priority is as a mum and I made sure Reuben was happy and fed before handing him over to “Mary” for the morning! 12noon – the kids loved the nativity! And it was the icing on the cake for them all that it was a real baby. Made it all worth it to see the faces filled with awe as they came into the stable and saw baby Jesus/Reuben. Now to head off to pick up big brother Sam from nursery – can’t forget about him! 1pm – arrive home after picking a tearful boy up from nursery. They couldn’t find the second sticky picture he had made and mummy hadn’t come to pick him up with his trike in tow, so it was a disaster. This was followed by several hours of whining when we got home and copious amounts of cbeebies to try and cheer him up and occupy him whilst Reuben slept. 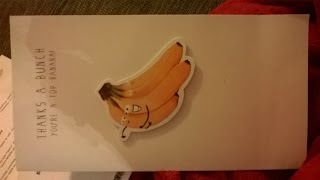 It did not go well…. 3pm – after feeding Reuben and getting very annoyed with Sam who kept trying to sit on Reuben’s head whilst I fed him, enough was enough and decided we all needed to get out of the house for some fresh air. Usual battle of getting ready commenced and all three of us ended up in tears. But it’s worth the battle to get out and deliver Christmas cards to the neighbours. We might not know everyone on our estate, but just this little token of Christmas cheer might open up more doors and cement some relationships. 4pm – return home with all of us in a better mood. 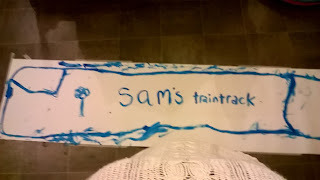 After walking and praying for some inspiration for what to do with the remaining hour before dinner time (yes, it was one of those counting down the hours kind of days) we decided to paint our own train track on some wallpaper stuck to the floor in the kitchen. 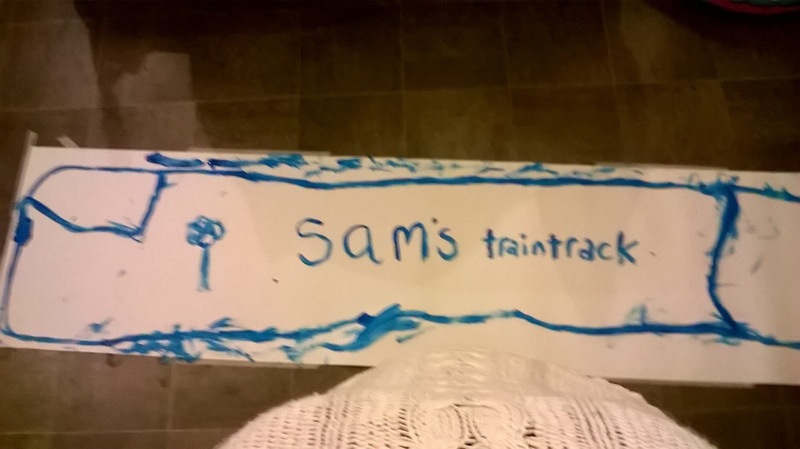 This pleased my biggest boy a lot, and I even had to make him a drivers hat and some cardboard tunnels. 5:30pm – well we made it through dinner time and now sat watching cbeebies until daddy comes home. We will soon enter the witching hour before bed time where crying and whining are the norm so rest is crucial! 7pm – both boys are now up in bed and mum duties are over for the day (well apart from nightfeeds!) so I can breathe a small sigh of relief and think over the day we had. Upset about the way I handled Sam’s whining but both boys were fed and clean and now in bed, so I guess that is a success! 8pm – after feeling a bit rubbish, went downstairs to find my neighbours who are moving away had put a thank you card through our door for being great neighbours. What a way for God to cheer me up and let me know that even the smallest community things like taking in parcels and inviting people to things can make a huge difference to others. God truly answered me when I was in distress and unable to cope by giving me ideas, inspiration and fresh energy to cope with the demands of motherhood. He also showed that even when I think my plans to connect with my neighbours have been pitiful and failed, that isn’t true. So today I shout for joy over the victory of this day and what God has been doing through it. May there be many more messy mummy missional days to come…..